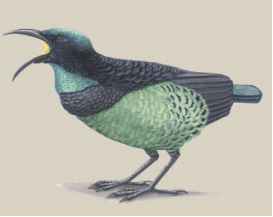 Physical characteristics: The male Victoria's riflebird has a curved bill; a bright green cap, throat, and belly; and a black back and breast band. It also sports short, iridescent blue-green tail feathers. 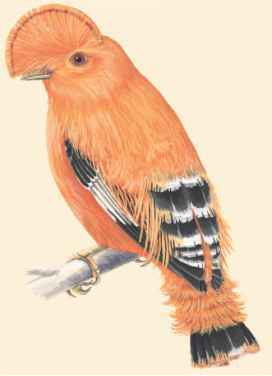 The female of the species has a brown back and head, a spotty buff belly and throat, and a buff stripe above the eye. Average length for both is 9.5 inches (24 centimeters). Geographic range: The species is found in northeast Queensland, Australia between Townsville and Cooktown. 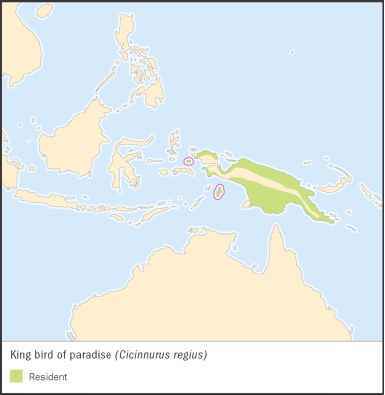 Habitat: The Victoria's riflebird lives in what is known as the wet tropics region of Queensland. It lives in low-lying rainforest and coastal mangroves. Diet: Like many other birds of paradise, the Victoria's riflebird uses its hooked bill to dig insects (such as insect larvae [LAR-vee], cockroaches, spiders, wood lice, and centipedes) out of tree bark. This species also eats fruit. Behavior and reproduction: Breeding season typically lasts from August through January. Male Victoria's riflebirds have multiple female mates. They perform an elaborate courtship "dance" of sorts by perching alone on a tree stump, outstretching their wings, bobbing their head from side to side, and calling loudly to potential mates. The female builds and tends the nest alone, and lays a clutch of one or two eggs, which incubate for up to eighteen days. She also feeds the nestlings alone until they leave the nest about fifteen days after hatching. Aside from the loud vocalizations of the Victoria's riflebird, the bird's wings also make a unique rustling sound both in flight and when extending and flapping its wings during its display, which helps birdwatchers track the species. Victoria's riflebird and people: The Victoria's riflebird has a fairly harmonious relationship with people. Although a good deal of the species' rainforest habitat has been cleared for sugar cane plantations and logging over the past century, the majority of the wet tropics area of Queensland is now protected against logging and habitat destruction by the Wet Tropics World Heritage Area Conservation Act and Protection and Management Act.